Caption slip reads: "Photographer: Bob Hecht. Date: 1956-07-20. Reporter: Hertel. Assignment: Civilian Defense gasoline check. 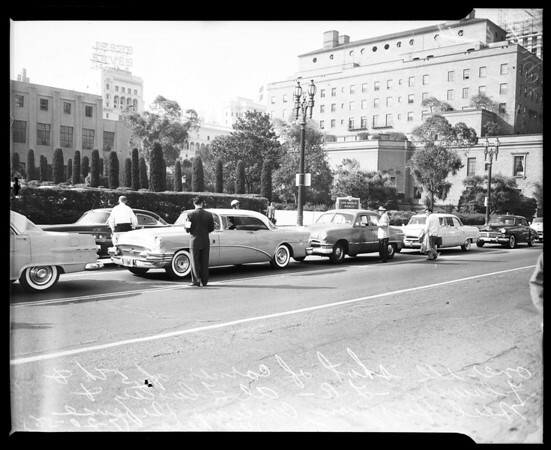 86-87: Overall shot of corner of 5th & Flower streets looking south as shown L to R Civilian Defense workers Al Fluster and Neil Higgins halt cars to check gasoline in cars. 54-55: L to R -- Mrs. A.J. Bumb, housewife, in car, Al Fluster and LAPD officer G.S. Arnest as officials check her fuel gauge to see how much gasoline she has in car."